This paiche fish recipe is an excellent choice for cooking fish at home. 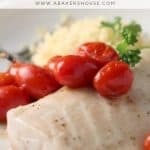 This mild, white flaky fish is perfect for roasting and makes an excellent weeknight, healthy dinner. Cooking fish can be intimidating: first you have to approach the fish counter and figure out which fish among all the offerings is right for you (halibut, salmon, catfish, flounder and more), then once you get home you need to pick a cooking method (fry, bake, pan-sear, roast and the list goes on), and you are not finished yet, you’ll need to know how to tell if your fish is properly cooked (yup, this part, too, can be overwhelming!!! for the fish novice). What fish should I buy at the grocery store? …what are you to do? Skip the healthy choice of preparing fish at home and only order it in restaurants? No! Start with the basics and keep it simple. This paiche fish is the perfect place to start. Let me show you how to take the mystery out of serving fish at home. We’ll start with a fish that made an appearance on Iron Chef a few years ago as a hard-to-find ingredient but now is available for home cooks exclusively through Whole Foods: this fish is PAICHE. Paiche is a white-fleshed, mild fish from Peru. It is a sought-after fish in its native freshwater Amazon River Basin and its population was decreasing because of over-fishing. Clean Fish, a company focused on helping fisheries and farmers to bring fish to markets in a sustainable manner, is working to replenish the paiche population in freshwater earthen ponds in South America. The fishmonger at my local Whole Foods described paiche as having a texture similar to catfish and a taste like Chilean Sea Bass or cod. Paiche is a huge fish, one of the largest freshwater fish in fact. It can be more than 400 pounds! Your fishmonger will cut it into fillets for you to take home. It’s also known as Arapaima, paiche is quite a remarkable fish. I learned more about this amazing fish in this youtube video which you might enjoy too. Because this fish is firm, not “super-fishy” (yes, you fish novices know what I mean) and can easily be portioned into thick filets, it lends itself to a variety of cooking methods and it is difficult to overcook. Perfect for those of us entertaining the idea of cooking fish at home! Learning how to cook paiche isn’t difficult. In fact, this is an ideal fish to enjoy at home. 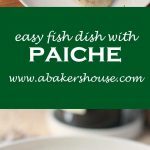 Let’s look at the ways to make paiche fish recipes. Can I pan sear paiche? Yes, a pan seared paiche fillet would be a great idea! The fishmonger suggested a light breading and cooking the paiche in a pan. A second suggestion for paiche was to coat it with a spice rub then to pan-sear it. I took the latter advice and liked the pan-searing results but for me, pan-searing takes a lot more time and attention than preparing a fish and letting it cook in the oven so I gave the paiche a second try and liked the outcome even more. How do I bake fish in the oven? Try this easy baking preparation and let me know what you think. 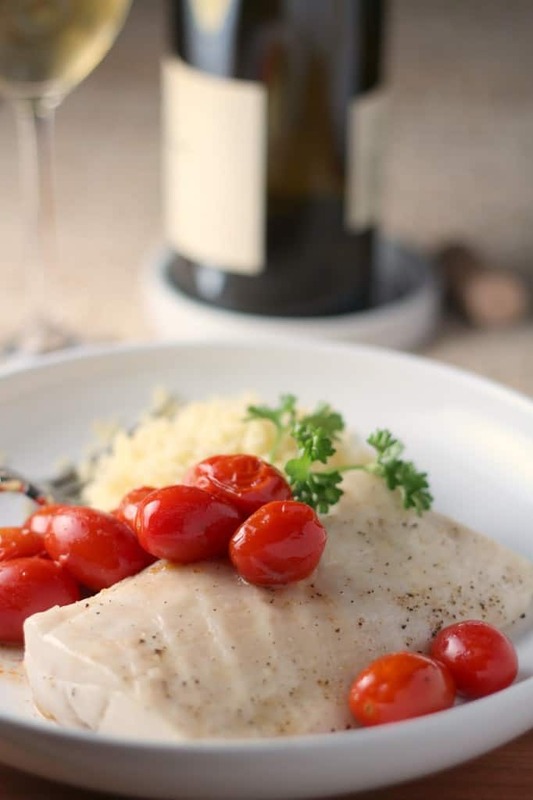 Baking or roasting the fish over some cherry tomatoes makes this an easy dish to share with company because your have a side dish and a main dish in one step. I think oven baked fish is the easiest way to learn to cook fish. How long should you cook fish in the oven? How do I know when the fish is done? The time will vary based on how large or small you fillet of fish is but this method works with cooking cod or any other fish for that matter. Use a thermometer to test the internal temperature. An fish cooking temperature of 145 degrees F is suitable for fish. Another good method for seeing if fish is cooked is to use a fork to flake back a small piece. If it flakes easily and is opaque (you can’t see through it — it is not translucent– as you would consider raw fish) then you are good to go. What side dish is nice to serve with fish? The tomatoes roast, getting juicy and hot, and they create a ready-made sauce for your fish too. 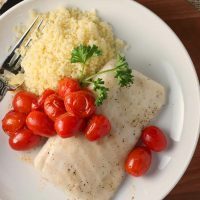 Prepare couscous or quinoa on the stovetop in less than 10 minutes while the fish and tomatoes roast and you’ll be ready to enjoy this meal in no time at all. Serve this paiche recipe with a green salad as well for a colorful and healthy meal. Try this easy oven baked method to make fish at home. 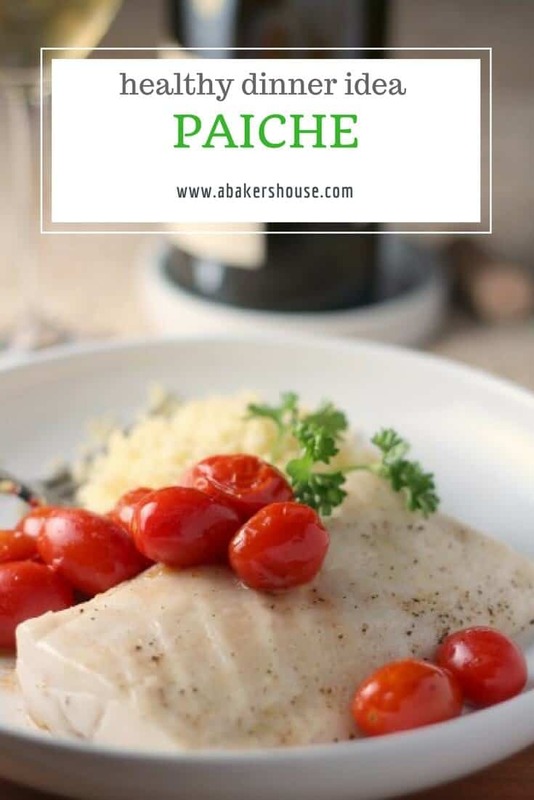 Cooking with paiche is similar to sea bass or cod. Layer sprigs of thyme on the cherry tomatoes then place the fish on top. Spray the fillets with baking spray or top with a few drops of olive oil. Season the fish with salt and pepper. Roast at 400 degrees F for 20-25 minutes or until the fish has cooked through. 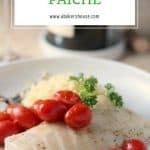 If you can't find paiche then make this simple fish recipe with cod or sea bass. Save this healthy dinner recipe for paiche for later on Pinterest! I think this fish would make a great curry as well. I saw it at whole foods and am thinking of making it soon. Ansh, a curry hadn’t crossed my mind and that is a wonderful idea. Paiche would hold up well in a curry. I’ll look forward to seeing a recipe for that on your blog! This looks like such a light, refreshing, healthy meal, Holly! And Whole Foods, well I just love Whole Foods. Thanks so much for the giveaway! Hi Holly! Nice to meet another Colorado blogger! Your fish looks great, too. Love your photos. Thanks for visiting my blog and I can’t wait to read more from you! This was my first time cooking paiche. Everyone loved It. Easy, delicious recipe thank you! So pleased to hear that! Glad you enjoyed paiche!